The 2014 FIFA World Cup is a celebration of the game of soccer (or football, if you prefer), but it is also an event that brings together millions of fans, celebrities, politicians, and all sorts of people from across the globe. And when those people mix with the actual footballers, and we add a little bit of technology to spice things up, you get some fun results. That’s what happens this year with the boom in smartphones, that brings us the 2014 World Cup: Selfie edition. 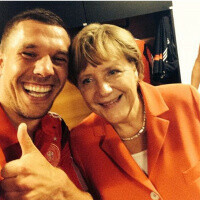 The biggest star of the home team of Brazil, Neymar Jr., kicks off this selection of selfies with a picture alongside teammates, but then we also have Germany’s biggest fan, chancellor Angela Merkel, pose with some of the players. Team USA was also visited by some high-ranking officials that gave their support - vice president Joe Biden in particular stepped in to the locking room, to congratulate the team on the first win. You can find this and much more in the selection of selfies from the 2014 World Cup right below, take a look. I hope Brazil doesn't win this time. It'll just prove how corrupt FIFA is. What is your favorite team? This may explain why you think FIFA is corrupt. My favorite team is doing alright, but Brazil is just plain bad this year. I feel that the media and FIFA artificially hype up Brazil's team just because they're hosts. The commentator in my country even shouted GOOOOOAAAAL for like half a minute each time Brazil scored against Croatia. For why FIFA is corrupt ask SONY and the other companies that want an investigation against them for choosing Qatar. LOOK at #4 with Portugal...the guy in the middle and the guy to the left of him.....THE EYES. Naymar is the selfie king .I think that's what he does best . He is a stupid player . He's a stupid player? Tell me about the many goals you scored in the World Cup. Well...he is overrated... Oscar is the best player in brazil now... He makes many chances...and neymar wastes most of it.... In last game he was not even able to score goal even with all the chances he had... And this from barca fan!!!! Well, I'm also a Barca fan. But I don't think he's overrated. He took Brazil all the way to winning the Confederations Cup last year. Sure, he had a bad season with Barcelona. But one must give him time to settle to the new conditions and style of play. I think he'll do great in this WC and with Barca the coming season. The way Brazil has been playing I really don't think they're one of the teams with the best chance of winning.